Well without actually wanting to, I seem to be getting my Xmas cards done. Sheesh... 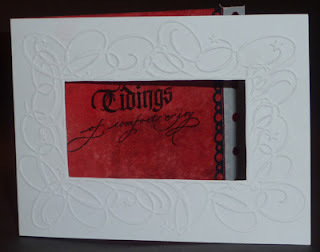 This is another easy design, that I can add different saying through the window and add various details on the inside to make each one personalized. I'm also using a Quietfire Design rubber stamp quote that I love. it's an oldie but goodie and works for all the non "Xmas" people in my life. Thank goodness for Xmas card challenges! Another gorgeous project...I don't always comment, but I want you to know that I always check out your work & just love to see what you come up with. Great card love the embossed front thanks for joining us at Incy Wincy. Lovely christmas card and thanks for sharing with us at Crafty Catz this week with our no pink or blue theme. How wonderful that you are getting some holiday cards done! I like this simple but elegant design. I see a peek of black punched edging inside, and that is a great detail, too. THanks for playing with us at The Play Date CAfe! Good to see folks getting a start on their Xmas cards.. love the frame.. Thanks for joining us this week at polkadoodles . Good luck . What beautiful Christmas card. I love the embossing. Thanks for joining us at Polka Doodles. Lovin' the window element! Thanks so much for joining us this week at Christmas Stampin' All Year Long! Great card! I can see doing several of these in different inside colors. Love that folder!